Kairos: Sad Puppies 4 Update: My Readers Are Awesome! Thanks, David. Readers like you are why I do this. P.S. The beta read of your book is underway. Great stuff so far! I just bought Nethereal and Honor at Stake off of amazon. Eagerly anticipating both. Of these I've only got around to Somewhither, but it absolutely deserves its placement. That is the book I would have passed around when I was sixteen to all my friends and would have geeked out over. Thank you! May Nethereal serve you well. I just started reading Somewhither, and your description already rings true. Am I the only person who had warning bells start going off when I saw that an Ancillary book was a contender for the Sad Puppies nominations? I suppose it's at least theoretically possible for it to merit (I haven't read it and probably won't), but my gut reaction is to suspect entryists. Given that Sad Puppies are explicitly not-explicitly-conservative, they seem to me a likely candidate for O'Sullivan's Law, and that may be beginning. 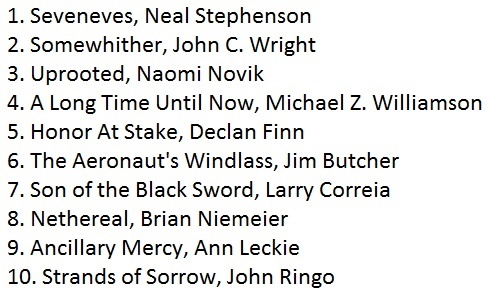 Of course, given the lack of focus (10 works per category) this year, I expect the Rabid Puppies to have more success than the Sad at the Hugos, anyway. Though SP4 may be the beginning of establishing an independent award, as opposed to continued scrapping over the Hugos. Not only have they apparently switched to an informal voting system for determining the list (SP1 and 2 were just Larry doing is thing, and SP3 was only, what, 3-5 guys making the final decision? ), but their About page already mentions an "alternacon;" I don't know if that is what it sounds like, but it sounds like an attempt to get a convention to be for the Puppies like WorldCon is for the Hugos. But perhaps I'm overthinking this. You're not the only one raising an eyebrow at some of the books suggested for SP 4. There are a few 770 regulars camping over there. Declan Finn noted as much, and he pegged it as an attempt to manipulate the reading list. He doesn't seem too concerned, though. So far, the results back him up. For a number of reasons, it's probably a safe bet that RP will continue its dominance from last year, and most likely expand it. Based on my conversations with other authors who've had interest/involvement in SPs past, 2016 could rival last year's drama. Hopefully before Friday. I have long flights for a funeral this weekend, and Soul dancer to read would cheer me up. I cannot promise that the book will be out by Friday. But if you would like to start with the finished manuscript, please email me and I will send you a free copy. 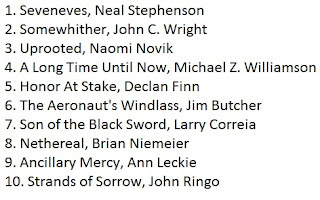 Also, about the Campbell award, my thought was that, since Nethereal was a legitimate contender for best novel (the sense of wonder and mystery kept me turning pages), and since it was your first novel, it had to go on the Campbell page as well. It was obvious. I am glad that others agree with that assessment. Yeah, you and enough others to put me ahead of Andy Freakin' Weir!